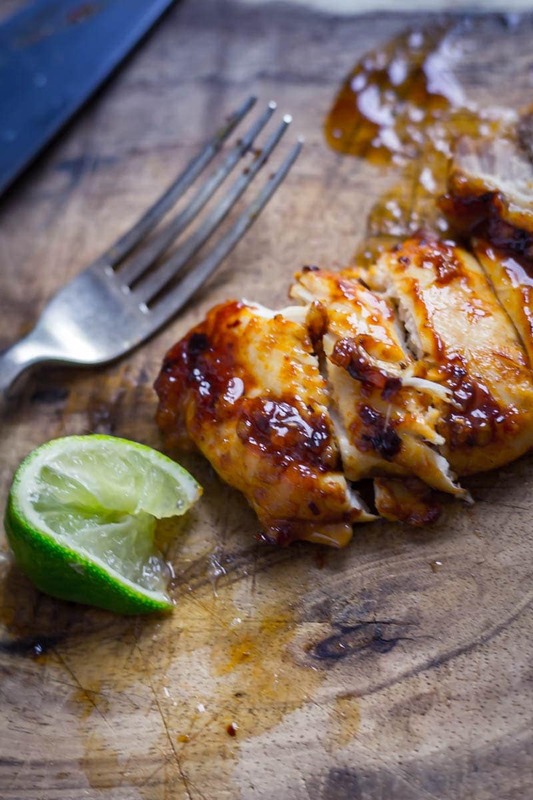 This honey chipotle chicken is the perfect combination of sweet and spicy. It’s so easy to make and is super versatile, serve it in wraps, sandwiches or with salad…the possibilities are endless! I love using chicken thighs in my cooking. They have so much more flavour than chicken breasts and they tend to be much more tender. If I’m not cooking a whole chicken then they tend to be my cut of choice. 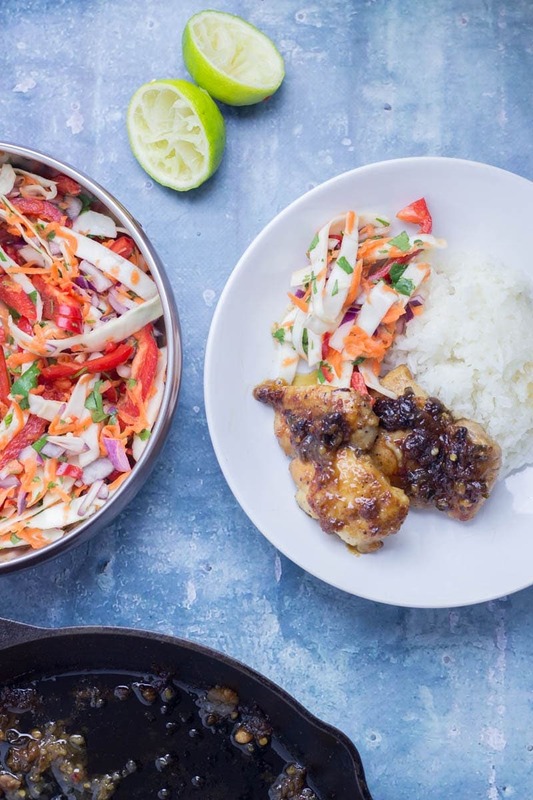 Some of my favourite recipes for chicken thighs include sticky Thai coconut chicken skillet with Asian slaw, buttermilk fried chicken sandwiches and grilled chicken with peanut sauce. Oohhh is it time for another holiday yet? It feels bizarre that I first made this honey chipotle chicken while I was off work for Christmas. Now everything’s all back to normal life. And I can’t even eat chicken for dinner because I’m not eating meat during the week. I have managed to completely avoid meat Monday to Friday since January started. Will fell off the wagon today by eating a chicken sandwich without noticing. That’s right, he claims he didn’t notice he was eating it. Apparently this is a thing. Poor Will, he’s quite upset about it but I think we can have one slip up every now and then right? Otherwise we’ve actually really been enjoying the challenge of coming up with new and interesting vegetarian recipes. 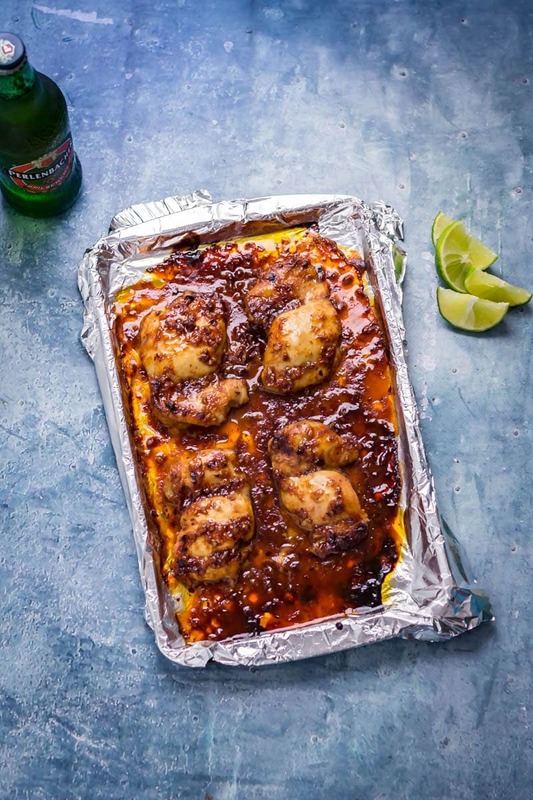 And what with still eating meat at weekends we’re still able to get our fill of yummy meaty meals like big batches of this honey chipotle chicken. If you have time try whisking together the marinade ingredients and adding the chicken the night before. It’ll really add to the flavour. 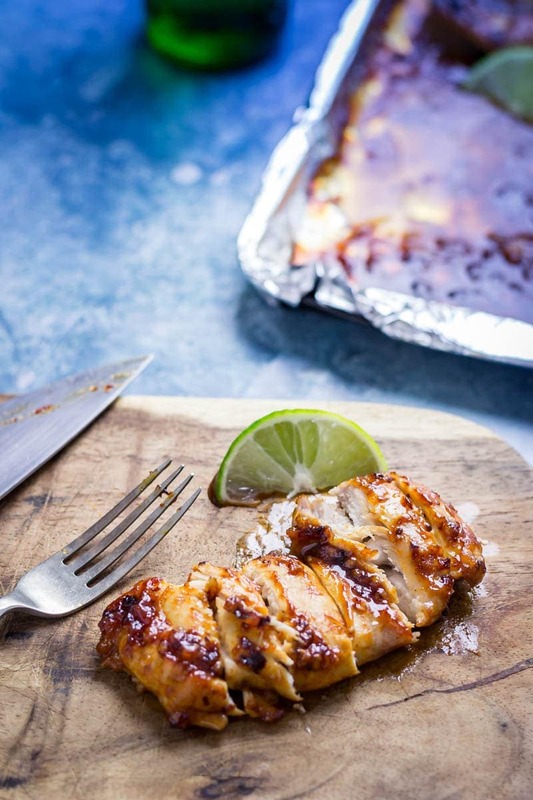 Start off with an initial 15 minutes to cook the chicken through with the marinade then drizzle over the honey and return to the oven at a higher heat to get super sticky and delicious! 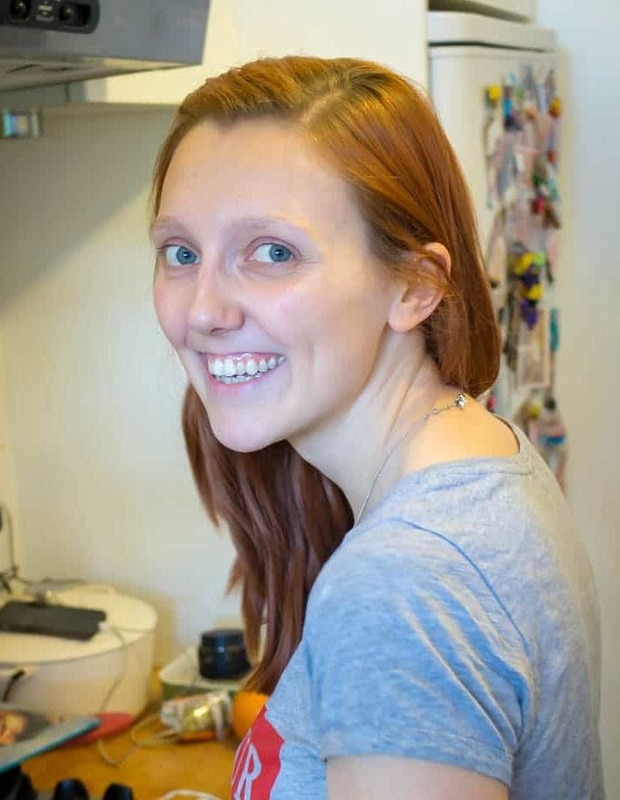 Now guys, this chicken recipe is so great. Let me tell you why. First off, it’s really really easy. 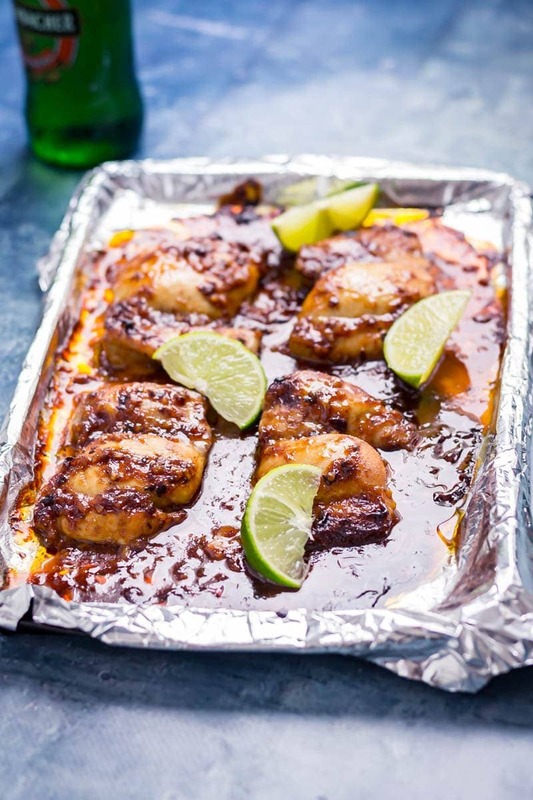 With a handful of ingredients you can whisk together a sweet, sticky and spicy marinade in a matter of minutes. Once that’s done you coat the chicken, spread it out on a baking tray and shove it in the oven, taking it out five minutes before the end to add a drizzle of honey. I’ve given the recipe for 4 chicken thighs but you could (and probably should) times that by several and make a whole lot of this honey chipotle chicken. Can you say meal prep?! 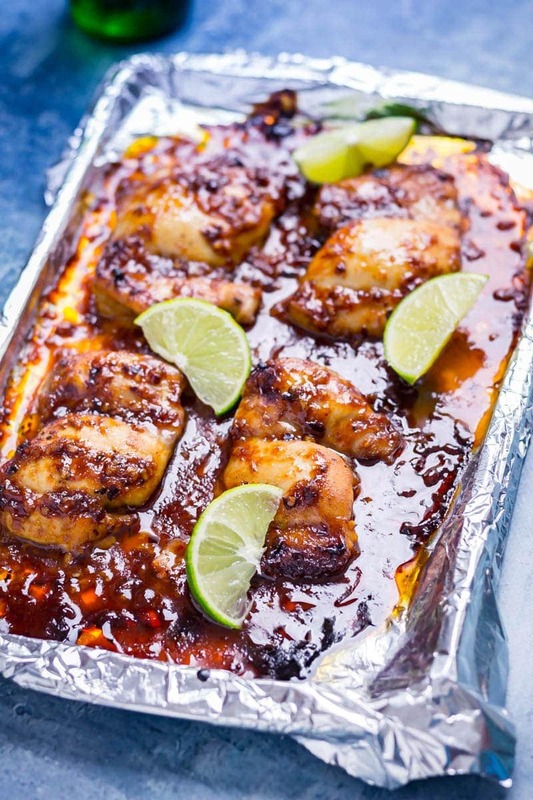 So now you’ve got a big old plate of honey chipotle chicken, what are you gonna do with it? Let me tell you. You could put it in a sandwich with slaw and a big dollop of mayo. Or you could serve it with a side of salad or wedges for a delicious dinner. Or or or you could put it in a wrap with sour cream and salad which is what I did and it was the best. So basically it’s just the perfect chicken for meal prep or just for a big dinner with friends/family. Enjoy! If you want more amazing chicken recipes then go right here…there’s loads to choose from! WONDERING WHAT TO DO WITH THE LEFTOVER INGREDIENTS YOU’VE GOT FROM MAKING THIS QUICK & EASY HONEY CHIPOTLE CHICKEN? 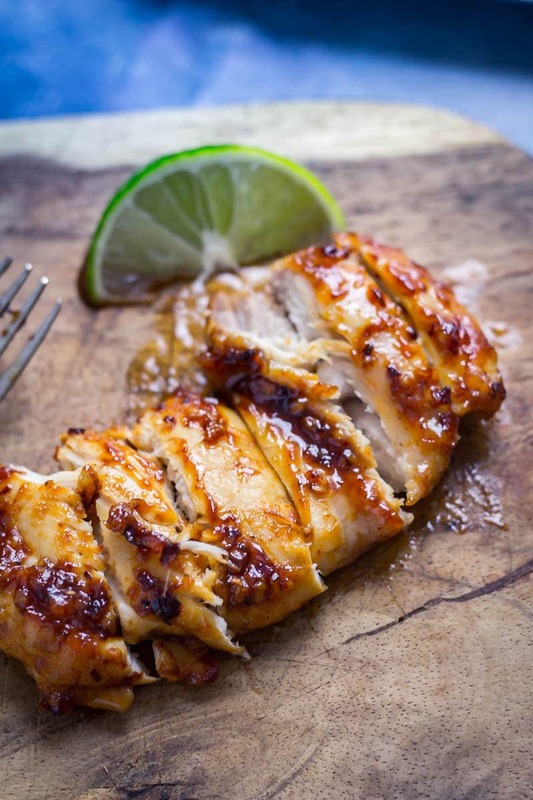 This honey chipotle chicken is the perfect combination of sweet and spicy. It's so easy to make and is super versatile, serve it in wraps, sandwiches or with salad...the possibilities are endless! Preheat the oven to 200°C/390°F. 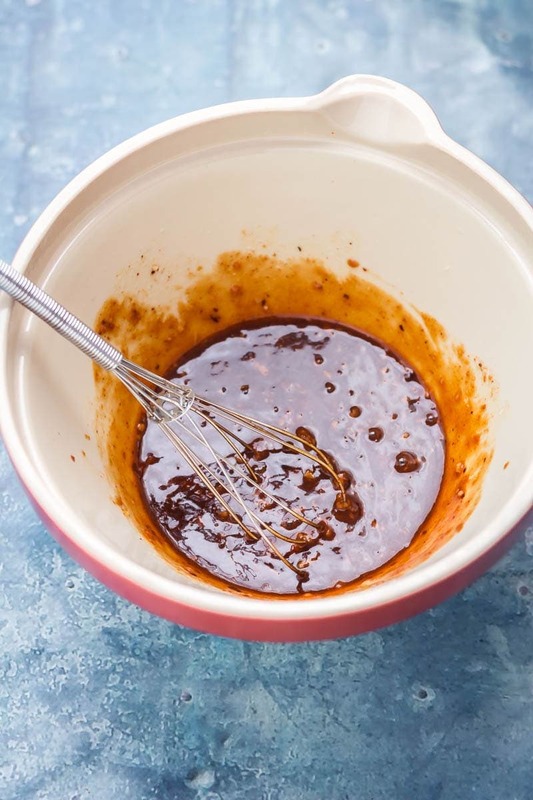 Whisk together the chipotle paste, bbq sauce, sugar, whiskey, garlic and lime juice. Add the chicken to the bowl and stir to coat. 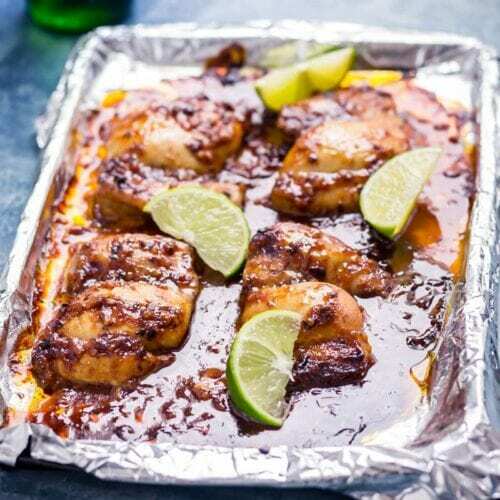 Cover a baking tray with foil then place the chicken on the tray and pour over any remaining marinade. Place in the oven and bake for 15 minutes. Remove from the oven and turn the heat up to 220°C/430°F. Top each chicken thigh with a drizzle of honey and return to the oven for 5 minutes. Serve with extra lime wedges if desired. Oh my goodness. This chicken! 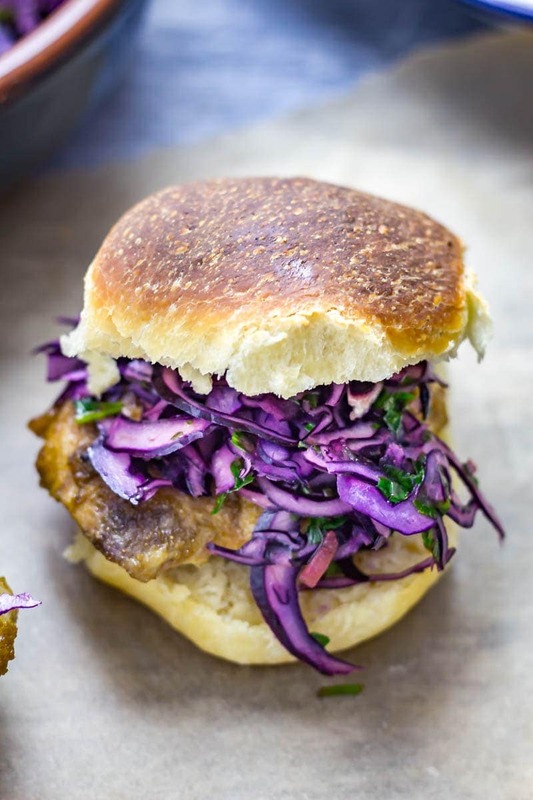 I am printing this out right now to try next week, it looks mouthwatering – thanks! My husband loves everything with chipotle! Can’t wait to make this! 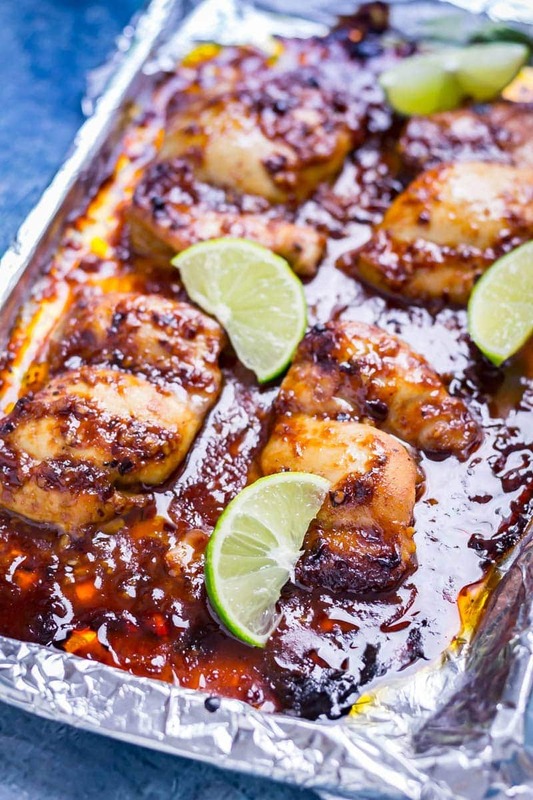 Honey Chipotle Chicken just sounds amazing and I love the sweet-spicy flavors. This looks so crispy good n easy to make. I think this will be delicious but it’s taking a bit longer than 20 minutes to cook….